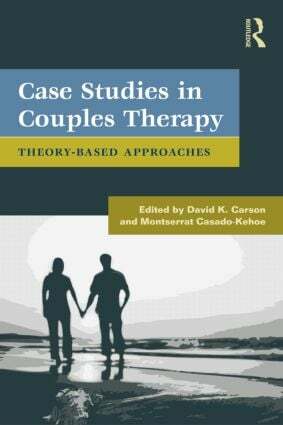 Carson, Casado-Kehoe, Couples Therapy in Contemporary Society and a Theory Based Case Study Approach. Olson-Sigg, Olson, PREPARE/ENRICH Program for Premarital and Married Couples. Parrott, Parrott, Preparing Couples for Marriage: The SYMBIS Model. Pregulman, Rienks, Markman, Wadsworth, Einhorn, Moran, Lessons Learned from Recruiting Diverse Couples for Clinical Research on Relationship Education. Robey, Carlson, Adlerian Therapy with Couples. Brok, Working with Couples from a Psychodynamic Perspective Using Cognitive Maps. Bagnini, Object Relations Therapy With Couples. Lawson, Integrated Intergenerational Couple Therapy. Dickson, Dattilio, Cognitive-Behavior Therapy with Couples. Patterson, Cognitive-Behavioral Couple Therapy. Lindblad-Goldberg, Igle, Simms, Ecosystemic Structural Therapy with Couples. Schlanger, Martinez, Problem-solving Brief Therapy: The MRI Approach to Couples Therapy. Anger-Díaz, Anger, MRI’s Brief Therapy Approach to Couples Therapy. Ray, Sutton, Strategic Couple Therapy. McLendon, Bitter, A Path to Wholeness: Couples Therapy within the Satir Model. Rheem, Woolley, Johnson, Emotionally Focused Couples Therapy: A Military Case Study. Hendrix, Hannah, Imago Relationship Therapy. Luquet, The Relational Paradigm and Imago Relationship Therapy. Carson, Casado-Kehoe, Creative/Experiential Therapy with Couples. Weiss, Atkinson, Holzinger-Young, Larsen, An Application of Pragmatic/Experiential Therapy for Couples. Burney, Group Oriented Experiential Couples Therapy: An Adventure Based Approach. Nelson, Solution-focused Brief Couple Therapy. Gallant, Strauss, Narrative Therapy with Couples. Wile, Collaborative Couple Therapy. Levin, Carleton, Collaborative Therapy with Couples. Navarra, Gottman, Gottman Method Couples Therapy: From Theory to Practice. Gasbarrini, Snyder, Affective Reconstruction: An Integrative Couple Treatment Applied to Parental Bereavement. Zentman, Integrated Couples Therapy: A Family Developmental Approach to the Treatment of Couples Incorporating Psychoanalytic and Systemic Models. Ripley, Worthington, Maclin, The Hope-focused Approach to Couples Enrichment and Counseling. Dr. David K. Carson is a Professor of Psychology at Palm Beach Atlantic University in Orlando, a Licensed Marriage and Family Therapist and Qualified Supervisor in Florida and Wyoming, and a Clinical Member of the American Association for Marriage and Family Therapy (AAMFT) and AAMFT Approved Supervisor. Dr. Carson has worked with a variety of couples in therapy and taught couples and marital therapy for many years. He has authored and co-authored 90 publications. Three books in recent years include: Creativity in Psychotherapy: Reaching New Heights with Individuals, Couples, and Families (2003; New York: Routledge) and two edited with his wife Dr. Cecyle Carson and colleague Dr. Aparajita Chowdhury: Indian Families at the Crossroads (2007; New Delhi: Gyan Pub.) and Family Life Education in India: Perspectives, Challenges, and Applications (2006, Jaipur: Rawat Pub.). Dr. Carson is extensively involved with the promotion of counseling and marriage and family therapy in India and travels to India regularly to teach and conduct training seminars across the country. He has also been a Fulbright Senior Scholar in India and has worked in community development in northern India and Nepal. Dr. Montse Casado-Kehoe is an Associate Professor of Psychology at Palm Beach Atlantic University in Orlando. She is a licensed marriage and marriage and family therapist and qualified supervisor for LMHC/LMFT in the state of Florida, a registered play therapist and a member of the American Counseling Association, and International Association for Marriage and Family Counseling. Dr. Casado-Kehoe specializes in women's issues, children and family issues, health issues as they relate to mental health and well-being and the use of coping. She integrates the use of a strength-based approach when working with individuals, children and families, and in supervision. Her work is experiential in nature and integrates the use of creativity and spiritual practice. Her research has focused on family therapy, play therapy, supervision and the integration of technology in counseling. She has also conducted research on helping families cope with a child’s life-threatening illness. She has coauthored two books, has written various book chapters, has been published in peer review journals, and has presented at the national and international levels. Dr. Casado-Kehoe was educated in Spain and the United States and is bilingual in English and Spanish.